The Working Method Contemporary invites you to attend the reception of “Close Water, Distant Water” to view multimedia drawing and sculpture made by second-year MFA, Caroline Ennis. There’s an opening reception on April 19th, from 6pm -9pm. The Working Method Contemporary is located at 2214 Belle Vue Way, Tallahassee, FL 32304. This event is free and open to the public! Caroline’s work explores forms associated with shallow and deep water experiences within and around the Gulf of Mexico. Her sculptures range from fluid fiber installations to ceramic objects. She combines research of material studies, memories from personal experiences, as well as creative exploration pertaining to out of reach places. 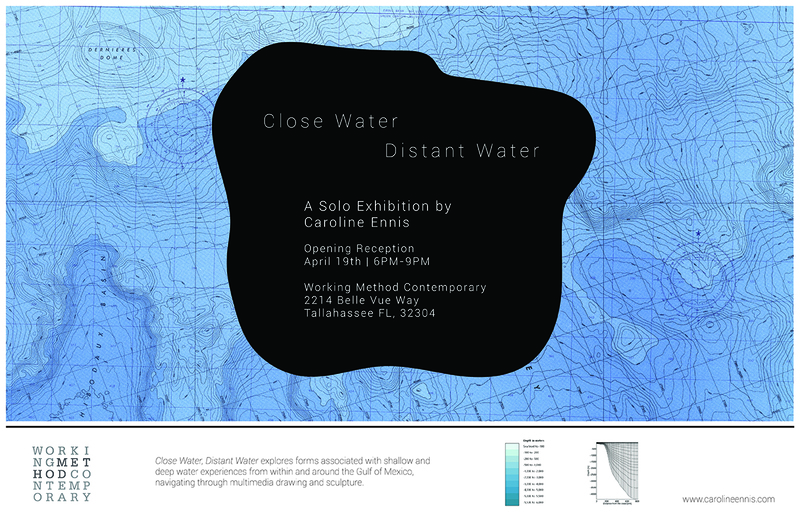 The work in “Close Water, Distant Water” navigates between exploration and sentimentality.